Our CTISr is an extremely robust and convenient tire inflation system for pressure adjustment on the go and is used primarily on trucks and trailers. 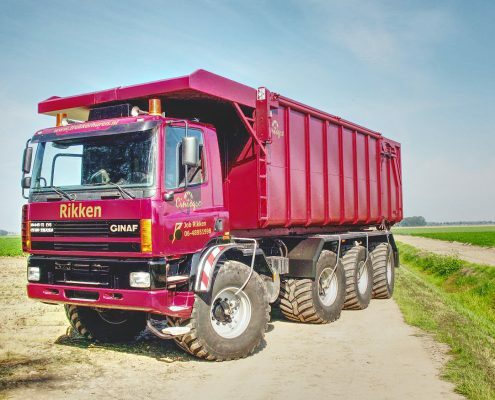 It has stood the test for more than a decade in the daily hard work of utility vehicles in agriculture and other applications. 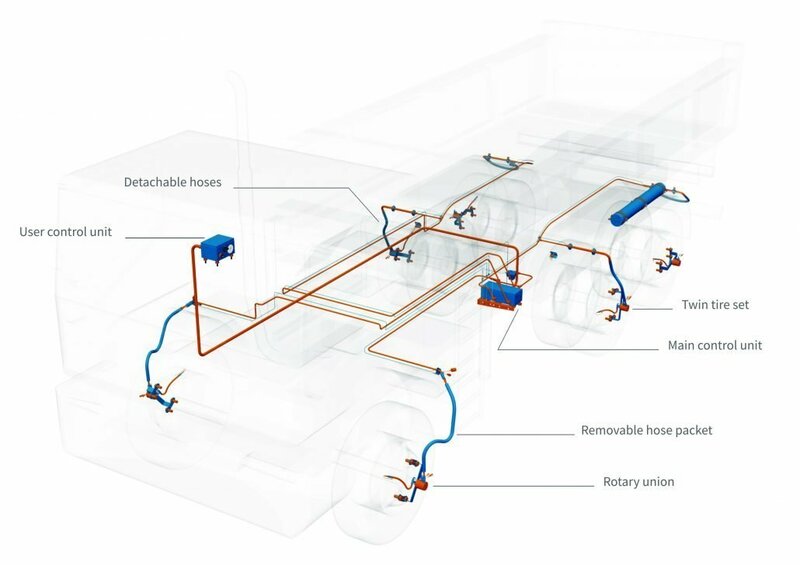 Its detachable and removable hose system makes the CTISr flexible to use and suitable for any truck and trailer, especially for retrofitting. Once activated, the system allows the user to select up to 8 individually preset tire pressures with just a flick of the wrist, and can be operated conveniently from the driver’s cabin. The purely pneumatic control unit adjusts the pressure of all tires to the selected setting before switching off automatically. A second control system can optionally be fitted to set different tire pressures for both the front and back axles (CTISr preset 4|2). The air lines to the wheels are taken from the fender to the wheel hubs, where our compact dual line rotary unions are fitted to the rims. Special brackets ensure that the lines maintain the correct clearance to the tires when the wheels are turned. 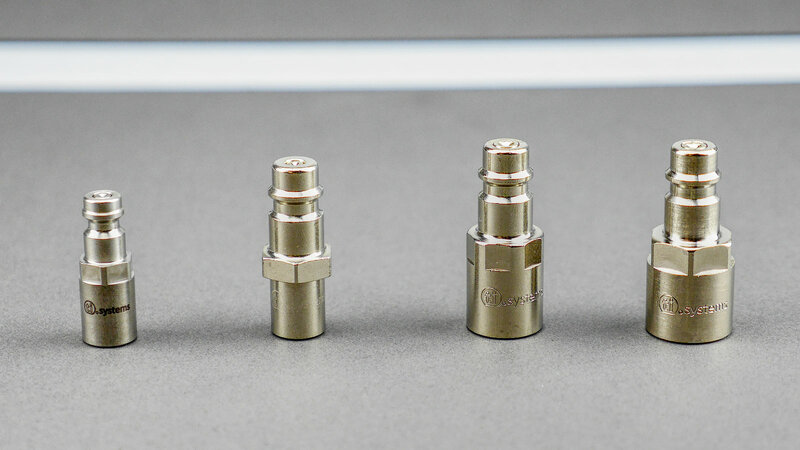 The detachable CTISr lines are simply connected to the rotary unions with special quick connectors, and can be disconnected easily when not in use and kept in dummy couplers on the fender. 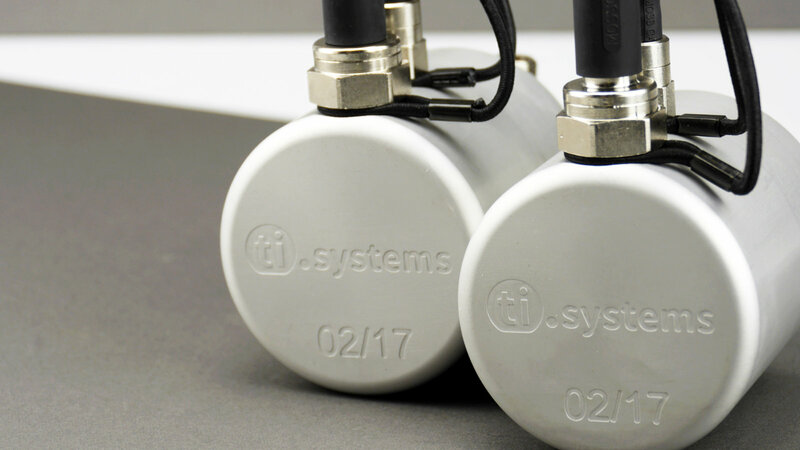 The removable CTISr lines can also be detached in no time and stored in a hose depot. The compact CTISr rotary unions with long-life grease filling are designed with high-quality seals and bearings in an anodized housing unit for maximum durability. The seals in the rotary unions are only under pressure when the tire pressure is adjusted, which is particularly important in light of the high pressure of your truck or trailer tires! A switchable wheel valve with anti-kickback attachment in the rim closes immediately if a line comes off while driving, to maintain the tire pressure. We offer two different types of our CTISr operating units which allows the user to adjust the tire pressure while driving. 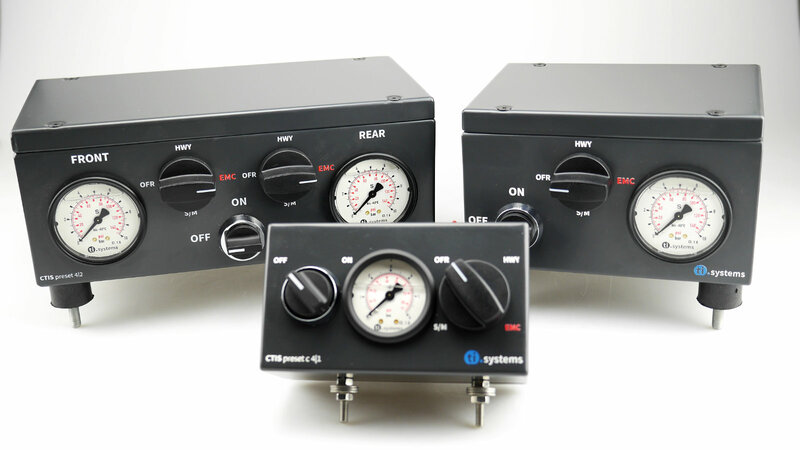 Our CTISr is built up of an operating unit and a separate control unit. The boxes are manufactured using high-grade 3mm sheet steel and are coated in colour shade RAL 7021 KTL*. Hence, the inner components are optimally protected from mediums entering as well as from weather conditions. The operating unit holds rotary switches for selecting the needed tire pressure as well as an ON/OFF-switch, both of which work purely pneumatic. 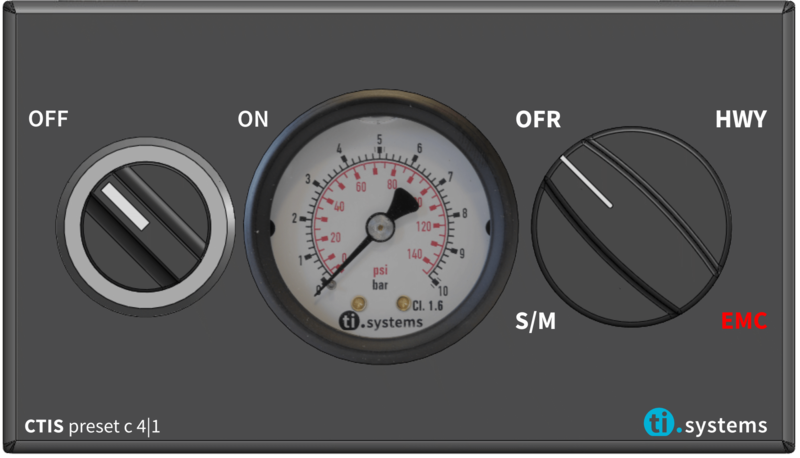 Furthermore, the operating unit has a manometer installed that is damped by silicone oil. The control unit holds one main regulation valve per regulator circuit. The CTIS preset 4|1 allows comfortable tire pressure adjustment on the move. Four tire pressures are preset as agreed with the customer and can then be conveniently selected as required by setting the rotary switch. The lines from the main control valve to the tires are fitted to the outside of the vehicle and are quick and easy to remove at any point. Thanks to the pneumatic ON | OFF switch, the lines and rotary unions are only under pressure when the tire pressure is adjusted. The innovative dual line system also means that the wheel valve opens only when sufficient pressure has built up in the lines. If a line comes off while driving, the wheel valve closes immediately to maintain the tire pressure. The vehicle remains safe on the road. 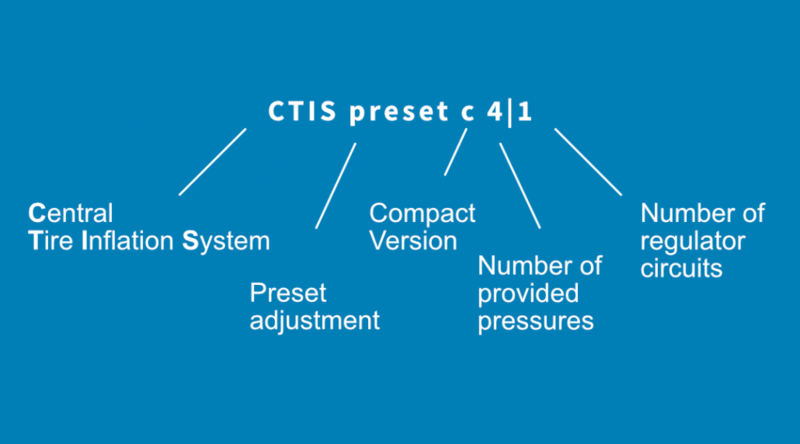 This advanced version of the CTIS preset 4|2 allows up to eight tire pressures to be preset. 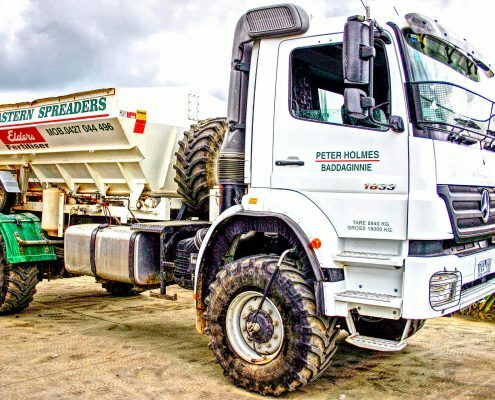 This means that four different pressure settings for both the front and back axle(s) can be selected and adjusted on the move. Again, the system remains at zero pressure when not in use, and the lines can be removed at any time.